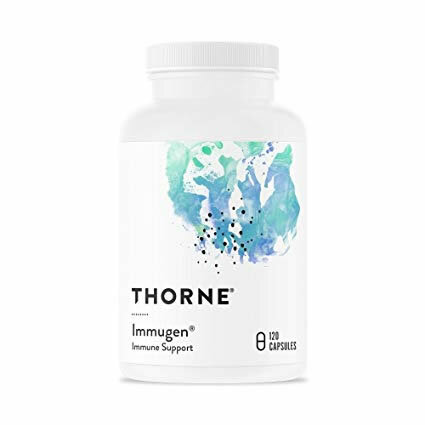 Home > Misc > See All Products > See All Dog Products > Immune Support for Dogs > Thorne Research Immugen - Immune Supplement for Dogs and Cats - 120 ct.
Immugen by Thorne - new look! 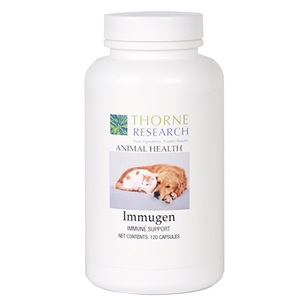 ThorneVet Immugen is an immune support supplement that contains vitamins, herbs and minerals to strengthen the immune system of dogs and cats. A properly functioning immune system is crucial to good health. Cats and dogs can face numerous challenges to their immune systems. The common practice of combining multiple antigens into one vaccination or not spacing the vaccinations far enough apart can overwhelm an immature immune system in young animals or in an immune-compromised older animal. Immugen's unique formula combines vitamins, minerals, amino acids, botanicals, and other nutrients for optimal immune system functioning and cellular health. Immugen is an immune support supplement for dogs and cats that is beneficial for dogs and cats with allergies, cancer, skin disorders and other immune related diseases. Immugen is an excellent product to use on allergy suffering pets. I have used it on my terriers for a few years. I tried another product that people recommended to me just to find my boys breaking out and itching again. I reordered the Immugen and they are back on it and back to having no problems. Believe this is helping 15 yo kitty with basal cell carcinoma. Taking along with C caps. Crush one of each capsule into can of wet food and feed it to her till can is gone. Looks like her growths are slowing down, less new ones appearing. Had her on it just about 3 weeks so too soon to tell. She doesn't mind the taste. I mix in wet food. Funny other cat who is healthy won't go near the stuff he hates it. So obviously something in her system wants/needs it. Anyway seems a lot more perky and cuddly like she was when she was younger. A lot more energy. And am expecting that her growths will subside/diminish completely over time. Yay so excited found this stuff thank you all for your awesome reviews which were cincher in me purchasing or not. One of our dogs (Jubilee - lab/Bassett mix) was diagnosed with cancer (mast cell tumors) a year ago, and another one (Sarah - husky mix) was recently diagnosed as well. Both of them are taking Immugen, and it does seem to be helping. Jubilee has been on it for a year now and there has been no recurrence of any tumors (she did have surgery w/clean margins on one, not on the other though). Sarah, unfortunately is not a candidate for surgery, but she has been on Immugen along with some other holistic treatments, and her tumors have almost completely gone away so we are thrilled, as it our vet. We also visited a holistic vet in addition to our regular one and she highly recommends Thorne products. Well worth it to us! 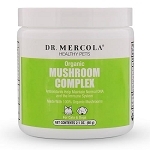 I use this product for fiv positive cats , to help boost their immune system. It is working! The company also provides excellent customer service. Thank you! Vitamin C - 175 mg.
Vitamin C helps in the production of collagen, promotes the healing of wounds and fractures, and strengthens blood vessels. It also enhances T-cell production which helps to fight off viral and bacterial infections and some allergies. Vitamin C is especially beneficial to animals with any type of chronic disease, infection allergy or dermatitis and may reduce the risk of certain cancers, heart disease and cataracts. Dimethlglycine (DMG) - 70 mg.
N-Acetyl-L-Cysteine (NAC) - 70 mg.
NAC is a precursor to glutathione, an important antioxidant. Glutathione slows down the aging process, helps reduce the side effects of chemotherapy, detoxifies the liver and supports the cardiovascular system. Echinacea angustifolia (root) - 50 mg.
Echinacea has been used extensively to stimulate the immune system to help fight viral and bacterial infections. It has also been used to heal wounds and skin problems and reduce inflammation. Reishi Mushroom - 50 mg.
Vitamin E supplies oxygen to the blood, strengthens capillary walls and protects red blood cells. It brings nourishment to cells and helps to maintain healthy membrane tissue. Vitamin E is especially beneficial to aging animals and animals with heart disease, cancer and atopic dermatitis. Astragalus membranaceus - 3.5 mg.
Astragalus root has been used for thousands of years in China to strengthen the immune system. More recently, it has been found to suppress tumor growth and restore immune function compromised by tumor growth in cancer patients. Thymus (Bovine) - 25 mg. The thymus is responsible for many immune system functions , including the product of T lymphocytes which help to protect against bacteria, fungi, parasites, viruses, cancer, allergies, dermatitis and immune disorders. Coenzyme Q-10 - 20 mg.
CoQ-10 is a nutrient present in every cell of the body. As animals get older, the body's ability to make CoQ-10 diminishes so it is especially important to supplement this nutrient in senior pets. Co-Q10 strengthens the immune system, supports and protects the cardiovascular system and helps keep gums healthy. Helps to fight gingivitis, stomatitis and other oral diseases. Pyridoxal 5 Phosphate (Vitamin B6) - 7 mg.
Vitamin A plays an important role in bone growth, tooth development, and reproduction. The skin, eyes and mucous membranes of the mouth, nose, throat and lungs depend on Vitamin A to remain moist. Zinc (Picolinate) - 3.5 mg.
Zinc is needed for enzyme reactions; cell replication, protein and carbohydrate metabolism, skin function and wound healing.A deficiency of zinc can lead to increased susceptibility to infection. Lycopene, the carotenoid that gives tomatoes their red color, is particularly effective at protecting cells and tissues from the damaging effects of oxidation. Lutein and zeaxanthin provide protection in the macular region of the eye. Mixed carotenoids may be beneficial to animals with cancer, cataracts, respiratory problems and allergies. Copper (Picolinate) - 350 mcg. Copper assists in the formation of hemoglobin and red blood cells by aiding iron absorption. Copper helps form the cover which surrounds nerve fiber, and it works in conjunction with vitamin C to form elastin, the chief component of elastic muscle fibers throughout the body. Folate (L-5-Methyltetrahydrofolic Acid, Glucosamine Salt) - 200 mcg. Manganese (Bisglycinate) - 175 mcg. Methylcobalamin (Vitamin B12) - 100 mcg. Selenium (L-Selenomethionine) - 7 mcg. Selenium protects cell membranes and slows down the aging and hardening of tissues due to oxidation. It is beneficial to animals suffering from cancer (and as a cancer preventative). Inactive Ingredients: Hypromellose (derived from cellulose) capsule. Dosage for dogs: 1 capsule for each 25 lbs. body weight. NOTE: Immugen capsules are large and may be difficult for cats to swallow. Capsules can be opened and sprinkled on pet's food or mixed with water and adminstered using an oral dosage syringe. We recommend introducing any new supplement slowly so that your pet gets used to the smell and/or taste. Some of the ingredients in Immugen have a strong scent which some cats find objectionable. Please keep this in mind when ordering Immugen as we cannot accept returns on opened items. See Cell Advance 440 or Immunity and Liver Support for an alternative supplement.